The thyroid gland is at the base of the neck. It has two lobes, one on the right side of the throat and one on the left, and they are connected by a narrow band called the isthmus. 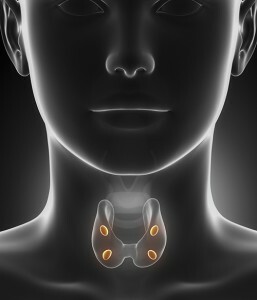 The thyroid gland makes important hormones that regulate metabolism and other critical bodily functions. Most tumors that form in the thyroid gland are noncancerous. Noncancerous thyroid tumors are fairly common in adults and may never cause a problem. Cancerous tumors comprise only 5 percent of thyroid tumors. Physical exam, CT scans, ultrasound and a fine needle aspiration, a small needle placed into the thyroid to remove a few cells, can help determine if the thyroid nodule in benign or cancer. Cancer of the thyroid is a disease in which cancerous (malignant) cells develop in the tissues of the thyroid gland. Papillary carcinoma is the most common type of thyroid cancer. There are several varieties of papillary carcinoma tumors. Most of them develop very slowly from the thyroid follicle cells and can be treated successfully, but a few spread more quickly and are more difficult to treat. The tumors often spread to the lymph nodes. Follicular carcinoma is the second most common type of thyroid cancer, but it occurs much less frequently than papillary thyroid cancer. These cancers do not spread to the lymph nodes and usually stay in the thyroid. However, they sometimes spread to other parts of the body. Anaplastic carcinoma is a rare and aggressive type of thyroid cancer that develops from either papillary or follicular cancer. It spreads quickly through the neck and other parts of the body and is often fatal. Medullary carcinoma develops in the thyroid’s C-cells, which produce hormones that help control the amount of calcium in the blood. There are two types of medullary thyroid carcinoma, one of which is hereditary (runs in families).